It may seem like a rhetorical question, but it is not. The Lord wants to bring “Break-Thru” into our lives. He’s building His Kingdom from the inside out. But it’s important to realize that there is God’s part and there is our part. The reality is that not everyone wants God’s best for their life. So, to ask, “Do you want to be made well?” is a legitimate question. Maybe one of the reasons Jesus asked this question was because in some places in the Middle East a man who was healed would lose a good living. Was such the case with this man? Was he comfortable in his condition? Did he ever look through the porticos of the pool realizing that if he was healed his life would face larger responsibilities? The question of whether we want God’s best is a legitimate question. The reason the “WANT factor” is so important is because the GROWTH and RENEWAL that the Lord wants to bring in your life requires some PERMISSION on your part. What’s your “WANT” factor look like on a scale of 1-10? Do you want change? Do you want to be delivered? Do you want a new beginning? Do you want transformation? The man Jesus was speaking with suffered from a physical handicap. But there are other types of PARALYSES! There is the crippling of BITTERNESS! There is the crippling of LUST! There is the crippling of just being COMFORTABLE with where you’re at undermining potential growth! As strange as it may seem there are people who do not want help! They like the lifestyle they have chosen. They are comfortable to be in darkness. And, other’s will “play the victim”. They want others to feel sorry for them. They crave the attention that it brings them! Ultimately, our WANT factor is revealed by how we believe and act upon the Word of God. For this man, Jesus said, “Rise, take up your bed and walk!” And, he did. The paralyzed man received the authoritative command of Jesus, believed it, and acted upon it, and was healed! What has brought paralyses to your life? What has held you over the years? Jesus came to bring “Break-Thru!” Today, “Rise, take up your _____ and walk!” Walk with Jesus in victory because in Christ you have the victory! 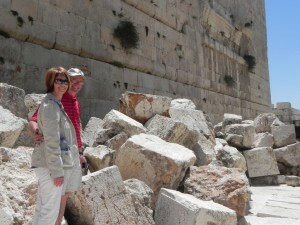 David and Liz Kiener at the southwest corner of the Western Wall the Temple Mt. standing among stones of the destruction of Temple in 70ad foretold by Jesus. 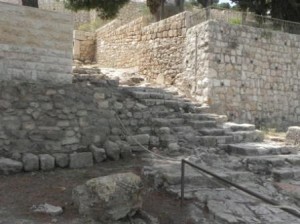 First century steps leading to high priest’s home. Very strong likelyhood that Jesus walked up these steps after being arrested in the Gesthamene, taken south down the Kidron Valley, and up these stairs. Saturday morning we attended a Sabbath service in Jerusalem with believers in Jeshua(Jesus)! Mitch Glaser, President of Chosen People Ministries(who has spoken at our church a few times), taught on Isaiah 53. What an incredible Messianic prophecy Isaiah chapter 53 is! It was written seven hundred years before Jesus gave His life on the cross and the details are undeniable. While traveling to Israel I spent time pondering and praying about various expository preaching and teaching series that I’d like to bring to our congregation. Listening to Mitch this morning added Isaiah 53 to that list! 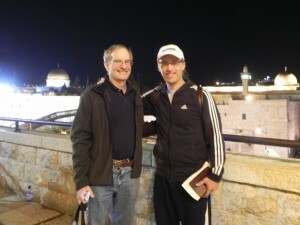 In fact, Mitch is in final editing stages on a book on Isaiah 53 purposed to reach Jews for the Lord Jesus. It has been “off-the-charts” today in Jerusalem! For years I’ve hoped to visit the location where the “Messianic Seal” was etched in the wall of a first century meeting place on Mt. Zion. Today, we found it! I couldn’t believe it. This treasure location is practically abandoned! For those of you who are unfamiliar with the symbol I am referring to, it is made up of three parts: a Menorah, Star Of David and a Fish. It is the earliest symbol associated with the “church” in Jerusalem. Some argue that over a period of time that the Menorah was removed, then the Star of David, leaving only the Fish, which we’re all more familiar with in association with Christianity, but reflecting erosion of consciousness of the roots of the faith. 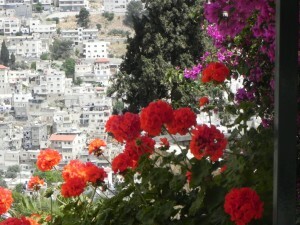 Aside from the garden tomb, Calvary and the Kidron Valley — this site is my favorite! Tears welled up pondering the possibility that this was a site the early church met, and that the Apostles perhaps even played a role in the shape of the “Messianic Seal” itself and that one of them maybe even etched it on the wall!? Well, I hope you enjoy the picture and a few of these comments. I want to thank all of you who are reading our updates and leaving comments. It’s a total blessing! We send our love from Jerusalem and we are praying for you! It’s been an incredible day! In fact, we traveled more miles today in Israel than I ever traveled in one day. 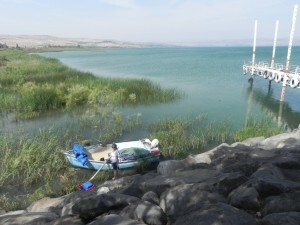 We began in Jerusalem and drove to Caesarea and Megiddo and Nazareth – and then spent time in Capernaum which is on the shore of the “Sea of Galilee”, all before 2:00 p.m.! After that we had a wonderful time at a baptismal sight in the Jordan River and then drove down the Jordan Valley to Jericho and then up to Jerusalem. 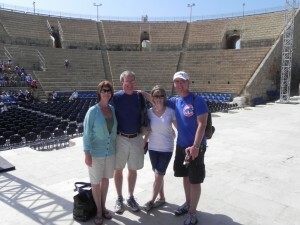 The first site that we visited was Caesarea, the capital of the Roman province of Judea. This meant that the Roman authority positioned itself in Caesarea. In fact ruins were found identifying that Pontius Pilate was governor of Judea and resided in Caesarea. It’s a port city with the presence of the Mediterranean Sea awakening your senses! The city was named by “Herod the Great” after Caesar Augustus. 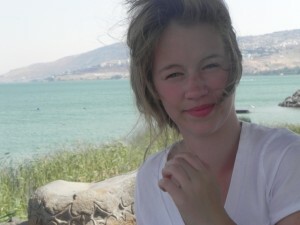 Today, it’s one of my favorite spots in Israel. 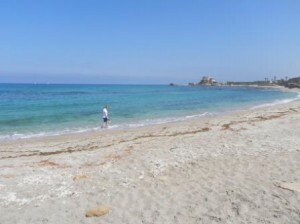 Not only is it extraordinarily beautiful(see above Lily walking on beach between the Governor’s palace at Caesarea and in the back-ground the port of Caesarea) but what first comes to mind is that the Apostle Peter visited a gentile man named Cornelius who made a commitment to follow Jesus! The story is recorded in Acts 10 and what a story it is! In short, it was a major turning point in Cornelius’ life as he came to faith in Christ, but it was also a turning point in Peter’s life as well. Jew’s just did not eat with non-Jews, not even would they enter a Gentile’s home. But the Lord was showing Peter otherwise and it proved to be a major turning point in church history and in Peter’s life some 10 years after the resurrection. We send our love from Jerusalem! 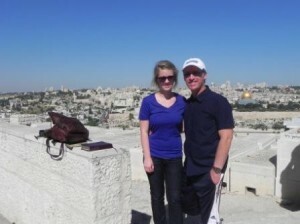 Today we began atop the Mt of Olives overlooking Jerusalem. It was incredible! Just to be able to look down upon the city that Jesus gave His life and rose from the dead and ascended to heaven, is beyond words. Jerusalem may seem like a foreign city to many of us, but the reality is that there is no other city in the world that has impacted our lives, and IS impacting our lives and WILL impact our lives, then the city of Jerusalem! It truly is the spiritual center of the world and the spiritual nerve center of the world and the prophetic epicenter of the world. As Christian’s it is our HERITAGE and FUTURE! What we believe about Jerusalem is a type of spiritual litmus test of the most important kind. And, the reality is, that in serving the Lord and making Him known in our generation, it has to do with Jerusalem, because everything is moving toward the COMING KING who is coming back to Jerusalem! Well, those are a few thoughts that I hope you have enjoyed! 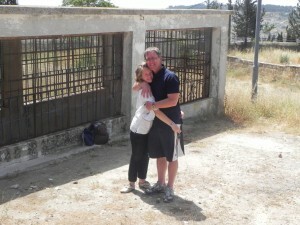 Tomorrow we head to Caesaria, and then to the Galilee, down the Jordan Valley to Jericho and back to Jerusalem. I’ll keep you posted! God BLess all of you and the entire Calvary Auburn family. I am praying for all of you. We send our love from the City of the King!! 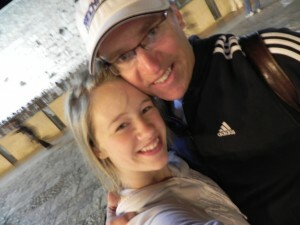 We’re headed to Israel Monday morning and arriving early evening Tuesday making our way straight to Jerusalem! Once arriving we’ll walk to the old city and behold the Temple Mt. I’ve been preparing for this trip for sometime because one of the objectives is to do some filming on sight in Israel and bring back some blessings to the church. I’m particularly looking forward to visiting the excavations south of the Temple Mt. 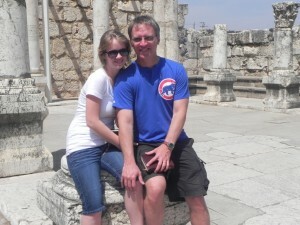 at the pool of Siloam. Do you remember what took place at the pool? It’s recorded in John 9 when Jesus took mud and put it in the eyes of a blind man instructing him to wash in the pool of Siloam. To be physically handicapped in the ancient world was a particular hardship and challenge. In effect your life was relegated to begging and dependency upon others. This was a man who had been blind since birth, having never seen the light of the day, the brilliance of a flower, not even his mother’s face! Obviously he could not see — BUT, he could HEAR and RESPOND to the WORD of Jesus! When you add God’s truth to be, heard, and God’s truth, to be responded to, the sky is the limit! “Faith” is like a “lens” thru which we see reality more accurately. Do you know everything? No. Can you see everything? No. The lens of faith provides “illumination” to what we can’t see with our eyes and grasp with our minds. Did Noah see something through the “lens of faith?” Yes! A need for a big boat! Did Abraham see something through the lens of faith?” Yes! A son, a nation, and a future Kingdom! For the man born blind, Jesus opened his eyes demonstrating that the MOST IMPORTANT reality is that we see the truth of God: the Lord Jesus!